I'm currently trying to decide to which spindle I should upgrade and I came across a few posts, where the Kress 1050 was recommended. For me It would be easier to get the Kress, than the Makita or the DeWalt, since I can pick it at a local cnc shop here in Austria and they even have a 3mm/1/8" collet. Now I'm wondering if anyone is actualy using a Kress on a X-Carve and what mount you are using for this spindle? I would also like to know what mount to use with the kress. It looks a very good upgrade spindle. I believe the 43mm diameter is something of a standard, so there should be other options, or one could just make one — making one’s own spindle mounts was something of a rite of passage on the SO1/2 days. Am I the only one who is thinking, "they have a LOCAL CNC SHOP?!!!" @WillAdams thx for the links, I'll into them. @JkWestphal There might be CNC Shop in vienna, but I haven't found a shop where they sell wood similar to what inventables sells. There are machine shops pretty much everywhere — have to be to support car repair/maintenance and other machines. Looks a little bit better, than the one @willadams posted. 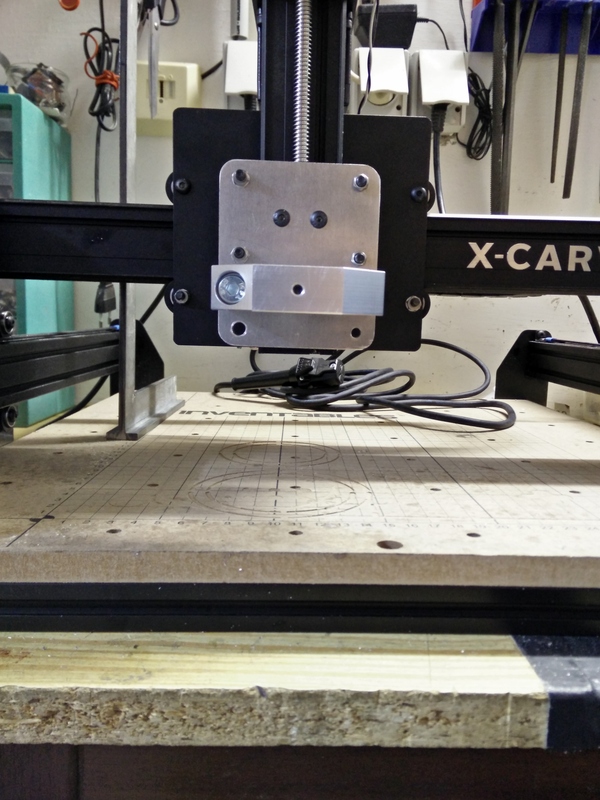 I just upgraded my X-Carve from the 300W spindle to the Kress 1050 and it really makes a difference. Almost no vibration anymore, faster, smoother and cleaner cuts. One difference to yours, is that I placed the delrin nut holes between the top and middle holes, where I mounted the wheels. This configuration allows the Kress spindle to go all the way down to the wasteboard. I haven't it realy tested, because I noticed that my x-axis is slightly tilted to the front, and I also want to stiffen it a bit. I know this is an old topic, but I am still looking at a Kress. Damencnc carries Kress' and also has a few mounts, there is one with an adapter for a vacuum hose. @Sebastian how did your 5mm plate rig turn out? 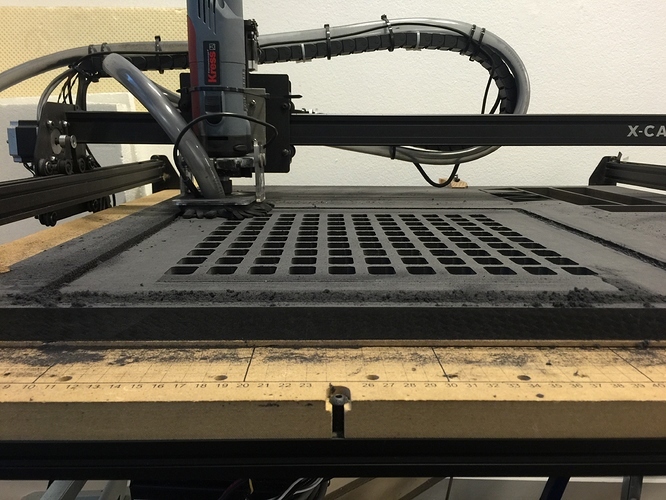 Have you thought about building one on your cnc machine? Yes for sure thanks for the link. I'm going straight into (my first) new build with only a Kress spindle so I just ordered the Ali/Sorotec aluminum mount for $26 shipped to expedite the process. @Sebastian 's z-plate appears to be the cleanest & most efficient I've found so far but I am just curious about the thickness of the plate as some people advise the Kress spindles need to be pushed out further considering their shape. 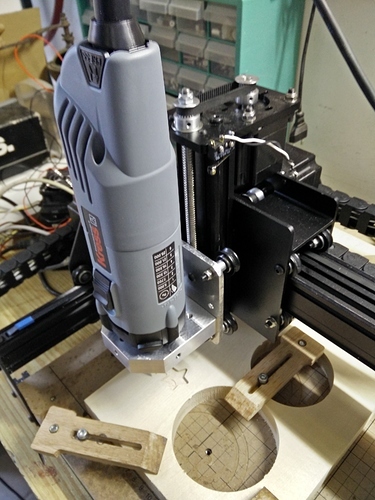 I have been using a 5mm Z axis/spindle mount with a Kress on my Xcarve for a while. It seems perfectly strong enough, and I just made it with a chop saw and a drill press. I'm, so far, really happy with my 5mm aluminum plate and the spindle and can recommend it. I'm currently using a second, modified version that works almost exactly like Sebastian's above – with the mount between the bottom and middle. The only thing left is something to ensure the Spindle stays straight on the X-axis. This is not a big problem, so far I solve it with a spacer and zip ties around the top of the spindle (which works, but doesn't look good). Best would be a second holder that goes around the chassis of the Kress spindle to hold the spindle in place so it can't vibrate in X direction anymore. I'm going to make an enhanced version of the mount within the next months and keep you updated.